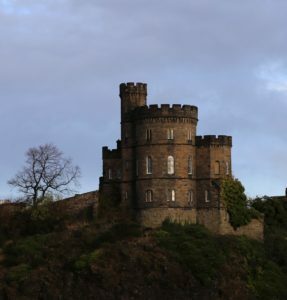 What is it about castles, especially the ancient castles of the British Isles? I love them, and so, it seems, do many of you. Here’s my guess as to why they are fascinating: they’re big and elaborate; they’re old and so have plenty of interesting history; and many of them are apparently haunted. 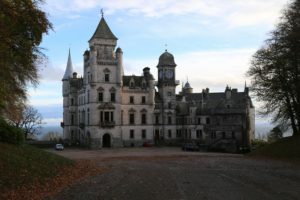 As I researched haunted Scottish castles I discovered a couple of interesting things. First, many (many) are haunted by someone described as a “Green Lady” (“Gray Ladies” are also a presence, but many more green – maybe for reasons I’ll come to.) Second, many are also associated with children. Naturally, both of these bear on THE CHARMED CHILDREN OF ROOKSKILL CASTLE. At Ethie Castle, near Arbroath, guests have heard the cries of a child at night, accompanied by the sound of a wheeled toy being pulled across the floor. The Green Lady of Dunstaffnage teases and plays with the living children of the castle. After a female skeleton was unearthed behind a wall in Fyvie, a Green Lady began to haunt the castle; she might be the late Dame Lillian Drummond, who was starved to death in 1601 by her husband (nice guy.) At Crathes Castle near Aberdeen, a Green Lady often appears near one of the fireplaces. She picks up an infant, and then they vanish together. Green Lady ghosts are only seen in parts of the United Kingdom, and nowhere else. They are described as slender young women in flowing green gowns with long golden hair. In some cases, they appear as protectors by local farmers, who cite stories of Green Ladies herding their animals to safety during storms or border raids. Many times they are associated with water. Legend has it that a Green Lady will arrive at a croft dripping wet during a storm and ask to be admitted, and when they are admitted they become the protector of that croft. The Dunstaffnage Green Lady and the Green Lady of Fyvie have also been thought to be Glaistig – a being that could be benign or a vengeful ghost. Glaistigs also have a water association. The water association of these spirits is not surprising given Scotland’s many lochs, rivers, burns, and rills, the frequent rains, and the ocean on all sides. I wonder whether the green in Green Lady is a reference to water, and maybe also to the watery aspect of a ghost. I’ve experienced a couple of haunted moments myself – one when many years ago I visited southern England and stayed in a hotel that was once a small castle in Devonshire, and was associated with my mother’s family. My mother and I shared a room and were convinced we were visited during the night. Perhaps it was a Green Lady, for she was very benign, and was visiting a mother and her child – maybe even her distant relatives! Have you ever had any ghostly experiences, or visited any haunted castles?